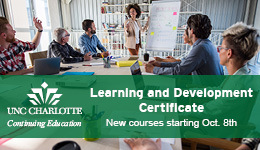 The Charlotte Chapter of the Association for Talent Development provides our members excellence in training and development services by enhancing their knowledge and skills which impact the effectiveness of their clients, organizations, and communities. The Charlotte ATD Chapter code is CH4067. Use this code on the ATD website to support our chapter.